TheRustedChain - The Blog: Cupcakes anyone? I love cupcakes. Really, who doesn't? And I love what a big trend they are right now. When I went on the behind the scenes tour of the Martha Stewart Studios, they even commented on how big cupcakes are. They were working on November and December issues of the magazines and including lots of cupcake things. I've known for a long time that I wanted a cupcake stamp, but they're surprising hard to draw! My only requirement was that it have a heart for a cherry. After numerous sketches by different people, Heather, one of the girls who works for me, came up with this adorable one. And immediately I knew it was right. I had it made into a stamp and it's exclusive to us! Here are a few designs with it. My Sweeties ... perfect for a mom to show off her sweet kids! So cute! Makes me hungry. :) I like "Life is Sweet." So cute! I like "Life is Sweet" the best! I love the "Life Is Sweet" one! Celebrate everyday! What a wonderful reminder! I love anything that I can put my kids' initials on. So, I love the last one best. But, all of them are super cute! my sweeties is adorable! you are so creative beki! They are all so cute..but I like the "Life is sweet" the best. you should be my neighbor. So cute! I love them ALL but my favorite is the "My Sweeties" one. love the one with the initials! so cute! sending this link to my girlfriend right now...her thing is cupcakes!!! i know she will love it! I love the 2nd and 3rd ones! Cupcakes are so good. Especially with crunchy buttercream icing! I think the Life is Sweet one would be my pick. 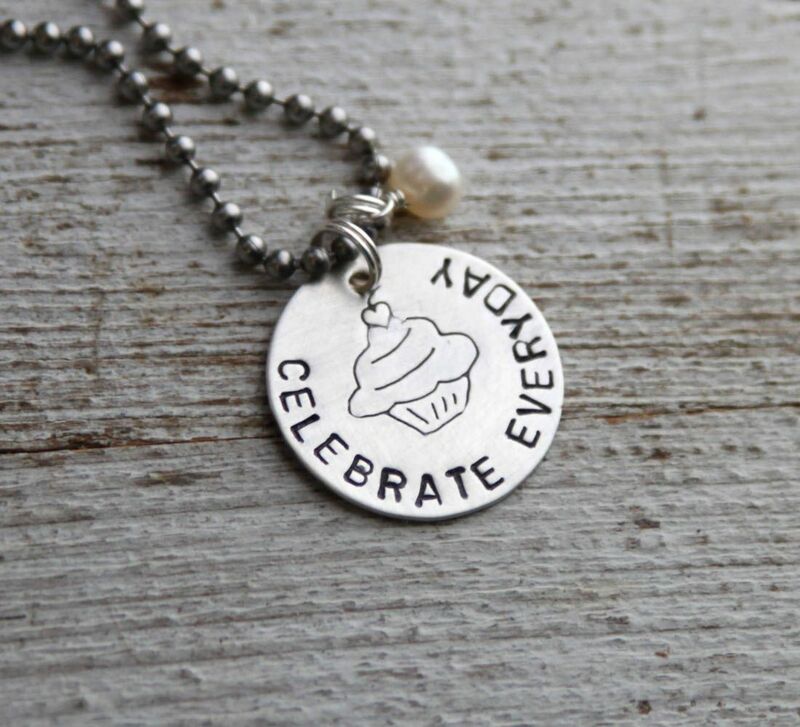 I love the 3 colored beads--looks like Neapolitan and the "Celebrate Everyday" Cute, cute! Ooh, I think the Life is Sweet is my favorite. gorgeous, beki! i am a sucker for anything with that typewriter font so i love 'life is sweet', but they're all wonderful. would you ever do a post on the people you work with?? maybe it's just me but i get totally nosy about the rusted chain team when you mention them! I agree with Ruth! I wanna see your team!!! I love "life is sweet"! Life is Sweet--are these in your Etsy shop? 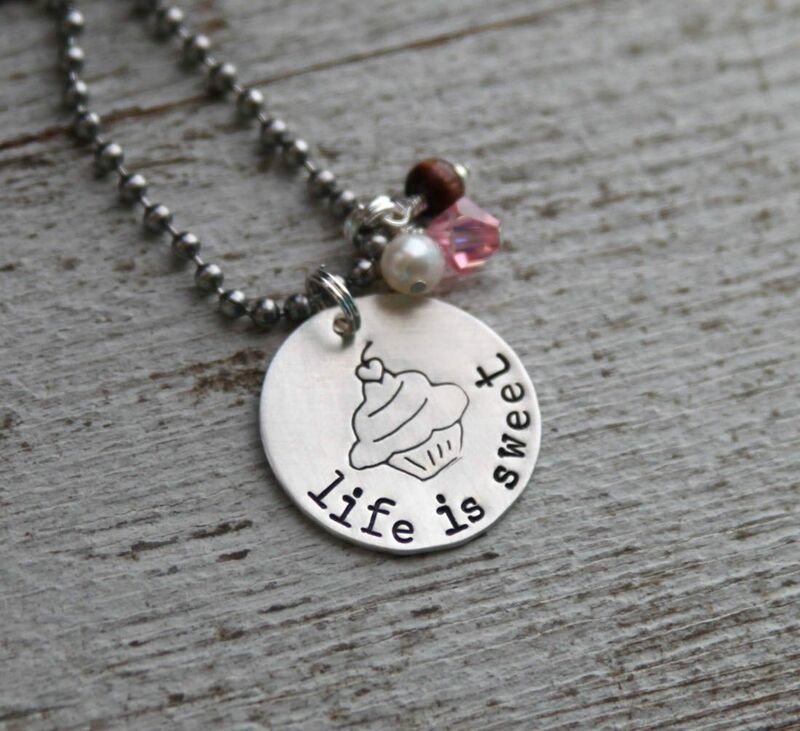 I am loving the Life is Sweet necklace with the sprinkles on top. Yummy! The first one is sooooo cute. LOOVE LOOOVE LOOVE the celebrate everyday! Life IS made up of ordinary days..you need to celebrate NOW!! aaahhh. I love the last one with the initials. After reading your blog I really get it now:) They are your "sweeties"! I found you over at Tatertots and Jello! I love your "Have faith and fly" charm!! 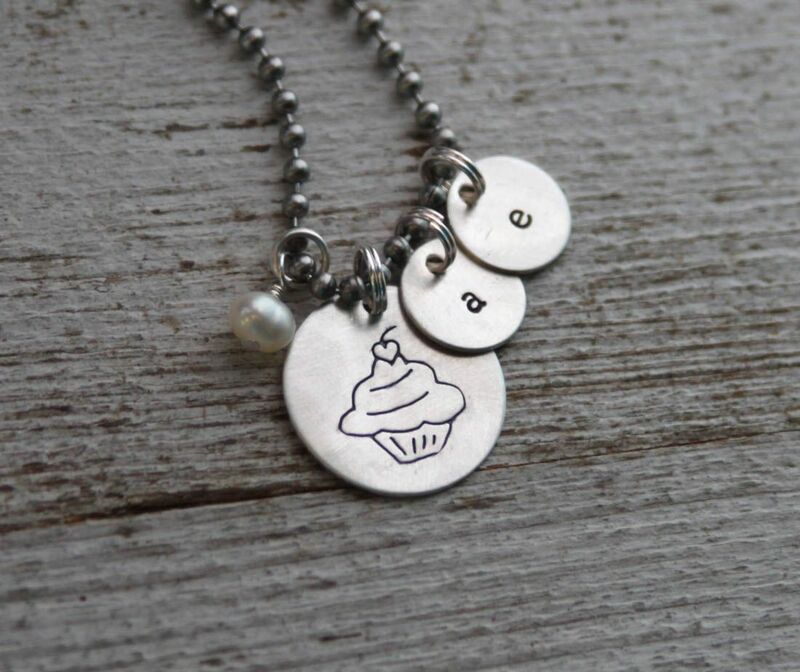 Your cupcake necklaces are gorgeous! !